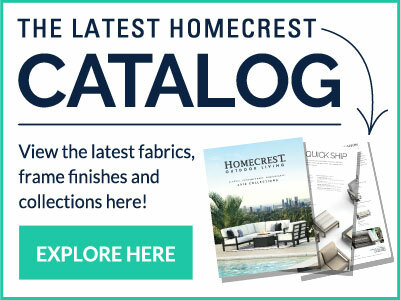 Whether you're looking for slings, cushions, pillows, paints or parts, with Homecrest Outdoor Living's exclusive replacement program, you can easily revitalize your existing Homecrest outdoor patio furniture. Replacements for our outdoor furniture are available in both current and discontinued products. Many of our classic outdoor furniture collections are still available today including our vintage wire frame collections. We bought our table and chair set in San Bernardino, CA in 1992 or 1993. The set has been outside, with original straps and seats, ever since. Eight of those years in Upland, CA., ten years in Newport, OR. and five years in Yachats, OR. 23 years total, of which 15 years were very near the salty ocean air, and they are still ready for another season. I am impressed. I'm keeping them until they fade away! My husband and I were talking about what a fantastic company yours is. On the subject of fantastic, so is Rosemary Oberg. I had a lot of questions about ordering replacement cushions, as I purchased your furniture fifteen years ago, Rosemary was prompt and patient with me every time. She s a superb ambassador for Homecrest. Oh, by the way, my old furniture looks and works as well as it did the day I brought it home from the store in Pittsburgh.